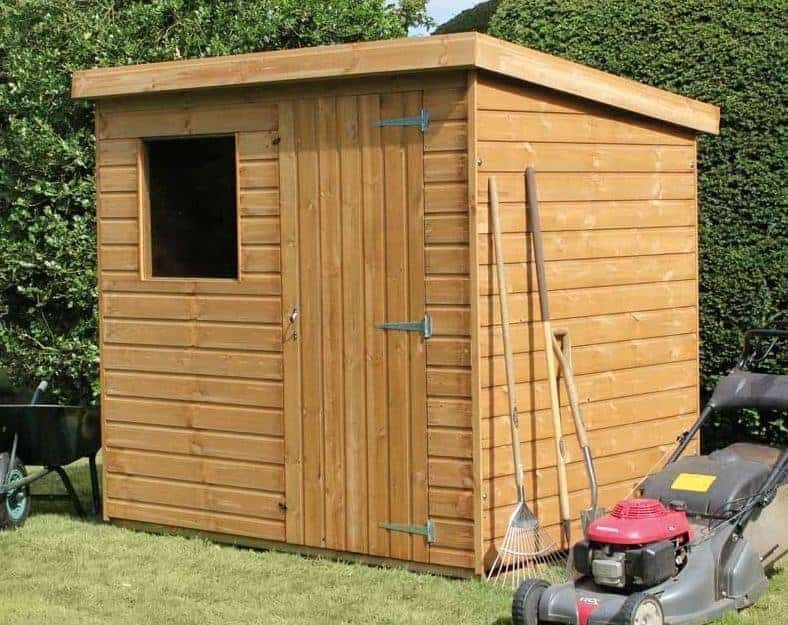 This traditional pent roofed garden shed will make a beautiful addition to any garden, and it also provides a storage space that’s as versatile as it is useful. One reason for this is that the position of the single door can be moved to one of three different locations, which can also affect the positioning of the three fixed windows. 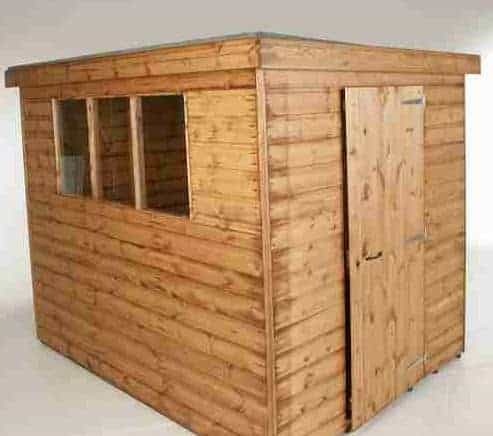 This means that the customer can get a shed that looks just the way they want it, at no additional expense. We were pleased to see that tough and high quality tongue and groove cladding is used throughout, including on the roof which is also covered with felt. This creates a solid and stable structure, and also means that it’s very difficult for water to penetrate. You won’t have to worry about the contents getting damp, and as long as the annual treatment schedule is kept up you shouldn’t have to worry about the appearance of rot either. As well as the weather, it’s also important that a storage shed such as this is protected against the possibility of break ins. We were glad, therefore, to find that a key operated lock is included as standard. It’s another example of the quality and attention to detail demonstrated throughout. We really liked the traditional look of this shed, and the almost square base area means that it offers a good amount of storage space whilst being able to fit into gardens of most shapes and sizes. Despite its classic, almost rustic, appearance it takes advantage of modern manufacturing techniques to bring the benefits that come from strong PAR cladding. We know that many people prefer pent roofs to apex roofs because they create a more even internal space, and have a more subtle appearance. Thanks to its tongue and groove cladding with mineral felt cover this roof is also highly effective at keeping precipitation out. The ridge height is 1.93m, while the eaves height is 1.80m. 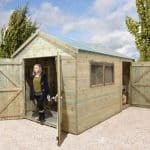 When choosing a suitable area to situate the shed remember to leave at least a foot in each direction around its overall width of 3.05mm and its overall depth of 2.44m, as this makes it easier to treat. The tongue and groove cladding has a thickness of 12mm, which is what we often find in sheds of this size, but once assembled it forms a stronger and more solid structure than many other timber sheds we review. The reason for this is that PAR cladding has been used, and it’s a feature that we always welcome. It means that the cladding is smoother and stronger, making it equivalent to standard cladding with a thickness of 16mm. Stability is also helped by the thick frame of 44 X 27mm. We were pleased to see that the floor was made of the same tough cladding, so it’s unlikely to need reinforcement. We would have preferred to see floor joists included, however, as we would recommend the purchase of floor joists to raise the base above ground level where moisture often accumulates. Thankfully, a suitable set of floor bearers is available as an optional extra. All wooden sheds have a minimum warranty period of one year, but we always like to see that extended as it gives the consumer added peace of mind. 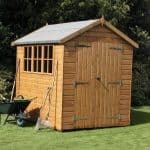 We were disappointed, therefore, to see that this shed comes with only the basic one year guarantee, especially as its cladding should be so effective at rot prevention. The manufacturer recommends that the customer applies a treatment of wood preserver six weeks after installation, in addition to the initial dipped coat the provide, and at yearly intervals after that. The thing that we liked most about the single hinged door is that it can be positioned centrally, or offset to the left or right. If offset, one of the windows will be adjacent to it, whereas if centrally located all three will be on a side panel. The door itself is braced and feels solid, and it has a width of 0.76m and a height of 1.65m, which means that you may need to bend slightly when entering and exiting. The three windows are fixed and include styrene glazing. We welcome this, as styrene is quite tough and shatter resistant. This is an important consideration if you have pets or children who are likely to play near the shed. Because styrene is more resistant to impact than standard glass this can also improve the shed’s security, but the security feature we liked most was the lock. Key operated, it provides a useful deterrent to would be shed thieves, and means that you won’t be worried about storing items of value inside, even though they might be able to be seen through the windows. 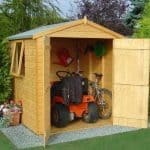 Whilst the door is adequate for most purposes, it may be that you want to use the shed to store wider objects such as bicycles. We were glad to see that for people like this there is the option to upgrade to a double door with a width of four foot. There’s also the option to change one of the fixed windows to an open window, or even to increase security by having no windows at all. We always welcome customisation options like these, as they put power into the hands of the customer. Another example of this is the optional installation service, available at just £114.99. 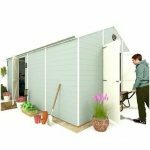 For people with busy lifestyles, this is an excellent way to get the shed you want without a delay. It was obvious to see the quality throughout this shed, and just one example was the chamfered corners used on the frames. 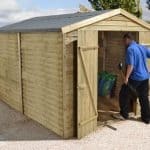 We feel that this shed has very good anti rain, and therefore anti rot, properties, which is why we feel that it should have come with an extended warranty. This is a mid sized shed for mid sized gardens, although we would have liked the eaves and doorway to be a little taller. 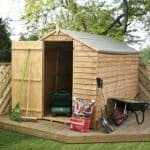 With clear instructions provided, you and a friend should be able to assemble this shed in around five hours, with the roof being the only component likely to present any difficulties. This is a very well built shed, and so in itself provides good value for money, but the apex roofed version is substantially cheaper, and the cost of the treatment requirements also have to be taken into consideration. Final Thoughts: Lovers of pent timber sheds will find a lot to like about this shed, and so, with a few reservations, did we. We feel that at this price it should have included floor joists as well as an extended warranty period. On the positive side, however, the quality of components used is very high, as shown by the use of strong PAR cladding on all the surfaces, not only on the walls. We also like the option to choose where you want the door and windows to be located, so that you can adapt it to fit in with the design of your garden.